lucy violet vintage: "The House That Time Forgot"
It is indeed crazy, but I love it. 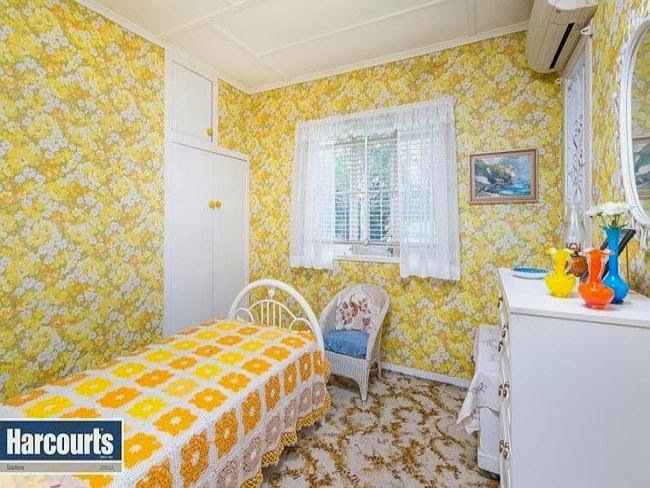 Ohh the yellow floral wallpaper... wow. I love it. Wow Kylie, you find the good stuff! I am not sure I could live in this but it is certainly straight from the 50's isn't it? When we were newlyweds we lived in my husband's late grandparent's house and it was very similar to this complete with carpet in the kitchen, wallpaper, blue patterned carpet and frosted, sliding glass doors. It is a rental now and I wonder how much of the original stuff is left? l want to live there ..as is..its so groovy! I did see this, and I think I saw something on the local news which showed the lady who bought it sitting with the original owner. The lady who bought it said she fell in love with it and would keep some aspects as they were but change others (she said she'd change the bathroom). I liked her attitude and the original owner was very good humoured about the whole thing. It's a happy ending really for such a fabulously genuine home. Well I'm joining you whole heartedly in the LURVE camp Kylie! 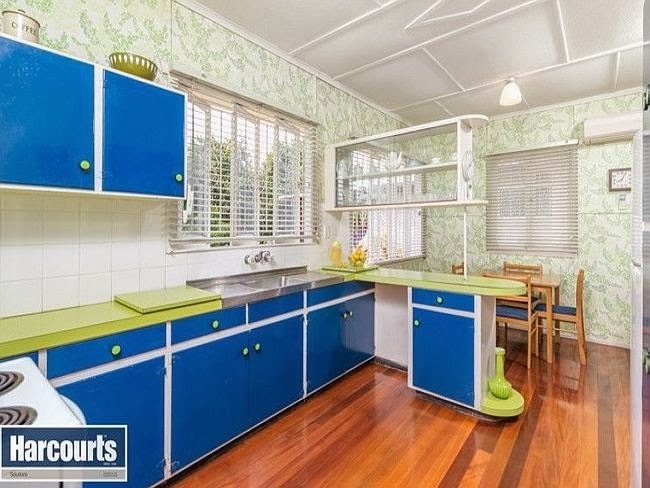 That lime green and electric blue kitchen with the wallpaper is glorious and fresh! The bedroom is a girl's dream and how about that lounge room hey? What a gorgeous feature wall - those rich colours!!! - and how about that coffee table eh??? Man, I have the perfect outfit for every room. Might have to photo shop myself in!!! Hee hee! The kitchen!!! Yay for green and blue!!!! 'with obvious pride' is what i like to recall from this. it gives me the jitterz, but in a nice way. like many of us, i grew up in such surroundings, so having a look at these makes my heart melt. it also brings back a feeling of no-thanks. so it's VERY mixed feelings, with an aftertaste of bitter sweet. This is a fascinating house Kylie, my Gran (Violet Lucy)'s house is now up for sale as she's had to move into a care home and that has barely been changed since the 1950's (or maybe earlier!) - not always a good thing! I think it will be a developers dream property. I love every inch of that house, absolutely perfection, and like you said, honest. 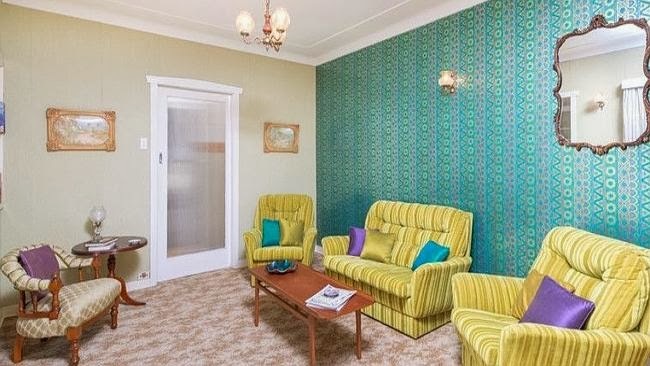 I love the living room with the turquoise wallpaper and yellow furniture! Life is finally returning to normal and the baby is thriving and could possibly be sustained fully on the mountain of love he is receiving, and so I read and catch up on the last couple of months in your life. 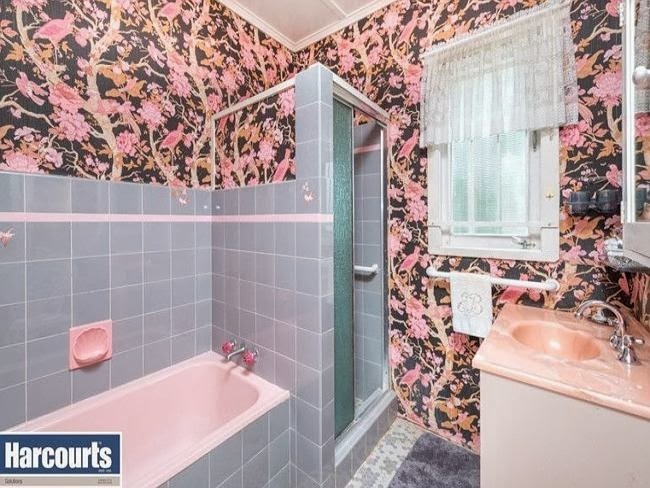 Loving all the reno photos and forgive me for placing all my comments in this spot and confusing the heck out of some readers when I talk about how full of admiration I am of your toilet which is yet to happen in blog post chronologicals. So many brilliant ideas but my favourite is the Readers Digest wall followed closely by the WC on the red door. As for this post I couldn't help but ask "did you notice the seldom seen Caroma colourway of the wall tumblers in the bathroom?" AND in the post of the five little dresses.....you had me holding my breath, I thought you were going to say you were expecting you wag!